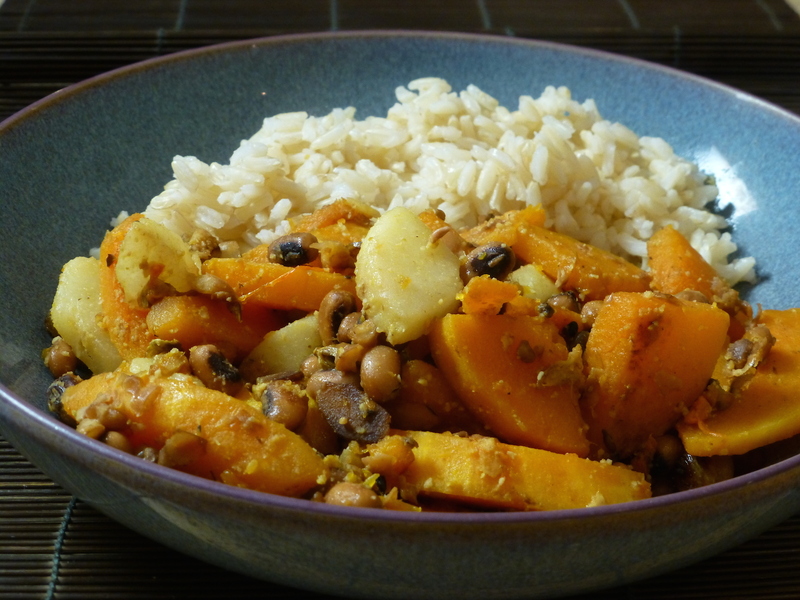 Butternut squash, pear and black-eyed bean stir-fry with brown rice • Quick & Tasty - Get Cooking! Quick & Tasty - Get Cooking! An unusual combination of butternut squash and pear with flaked almonds for an interesting texture. Cook the rice (see basics for how to cook rice). Wash and peel the butternut squash, slice it into thin (3 mm) segments. Do the same for the pear, put some lemon juice on the pieces so they don’t turn brown. Wash the beans in a sieve. Cook the butternut squash in the microwave, 3 minutes at full power (900W), stir, then another 3 minutes. Fry the ginger and seeds over medium heat for a few minutes. Add the butternut squash and flaked almonds and fry on high for a few minutes, until the pieces and flakes start to brown. Add the lemon juice lower the heat to medium. Add the beans and the soy sauce and the raisins and fry over medium heat. Add the pear and the garlic oil and stir well. © 2019 Quick & Tasty - Get Cooking!